Two Boeing-led teams completed 18-month studies and recently submitted their findings to NASA under a program called N+3, which denotes three generations beyond today's transport fleet. After examining various subsonic and supersonic concepts, the teams came up with configurations that met the NASA-stated goals for dramatic improvements in operational and environmental performance over today's aircraft. The Boeing subsonic team, which includes General Electric and Georgia Tech, looked at five concepts. The team's report provides detailed benefits and drawbacks as well as recommendations for further study, but doesn't show favorites. "No single concept met all of the study goals, so we did not pick a preferred concept," said Boeing's Marty Bradley, the team's leader. However, the team found that one concept known as SUGAR Volt - which includes an electric battery gas turbine hybrid propulsion system - can reduce fuel burn by more than 70 percent and total energy use by 55 percent. This fuel burn reduction and the "greening" of the electrical power grid can greatly reduce emissions of life cycle carbon dioxide and nitrous oxide. Hybrid electric propulsion also has the potential to shorten takeoff distance and reduce noise. The subsonic team's report concludes that hybrid electric engine technology "is a clear winner, because it can potentially improve performance relative to all of the NASA goals." Boeing and the three other teams providing subsonic aircraft concepts have submitted proposals for a second phase of studies to begin developing the necessary new technologies. This contract award is expected in the next few months. Meanwhile, the Boeing supersonic team, which includes Pratt & Whitney, Rolls Royce, General Electric, Georgia Tech, Wyle and M4 Engineering, focused on four concepts that include a low fuel burn/low boom swing-wing "arrow" configuration, a low sonic boom concept with a V-tail to shield noise and control the sonic boom, a joined wing alternate concept and an oblique "scissor" wing alternative concept. 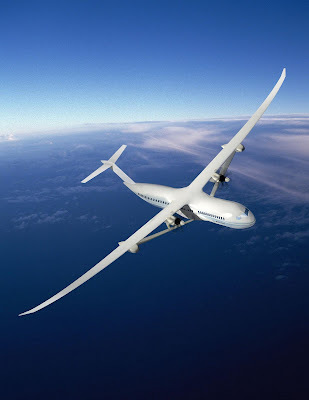 Based on conceptual design studies, the team recommended to NASA a fixed wing configuration (nicknamed Icon II) with V-tails and upper surface engines, said Bob Welge, Boeing's leader of this team. The Icon II concept can carry 120 passengers in a two-class, single-aisle interior, and can cruise at Mach 1.6 to Mach 1.8 with a range of about 5,000 nautical miles. The study acknowledges that supersonic aircraft inherently have less fuel efficiency than subsonic aircraft, but points out they offer offsetting productivity benefits because of speed. 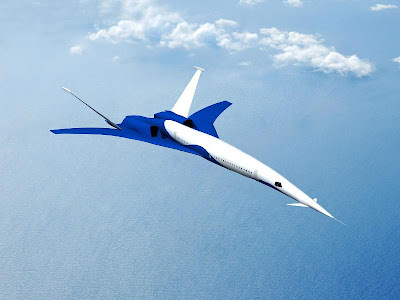 The study concludes that advanced technologies can reduce fuel burn enough that a supersonic aircraft could be economically and environmentally viable in multiple markets. The study also indicates that these efficiencies can be achieved while meeting the same community noise certification limits as subsonic aircraft, with a reduction of the sonic boom noise to 65 to 75 decibels. "That may make it possible for a supersonic transport to operate at maximum cruise speed, even over land," Welge said. The NASA N+3 supersonic program does not provide the option for a Phase II system study, but Welge said technology development research announcements are anticipated in the near term.